With your Docebo LMS, you can create a custom report to view and analyze specific information about courses, users, or learning objects in your platform. In order to create a custom report, log into your platform as the Superadmin. Access the Admin Menu by scrolling your mouse over gears icon in the left sidebar. In the E-Learning section, select the Reports item. 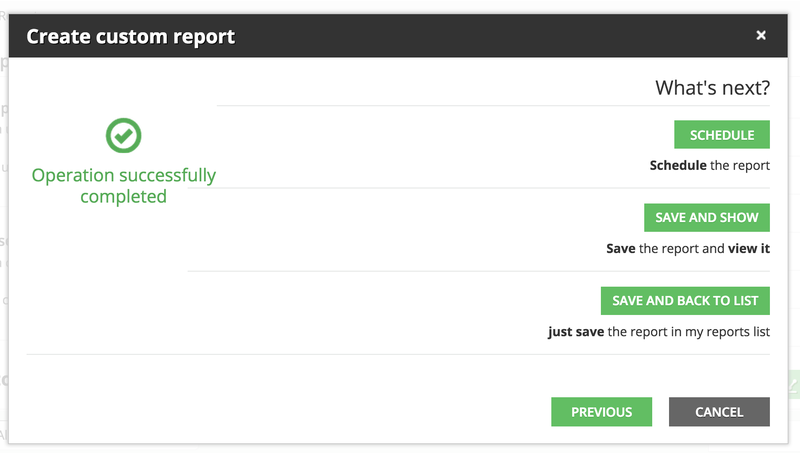 To start creating the report, select the Create Custom Report button on the main Reports page (this button is located underneath the Quick Summary Reports section). Then, in the pop up box, flag which kind of report you want to generate and give a title to the report in the Name text box. Users – Courses. 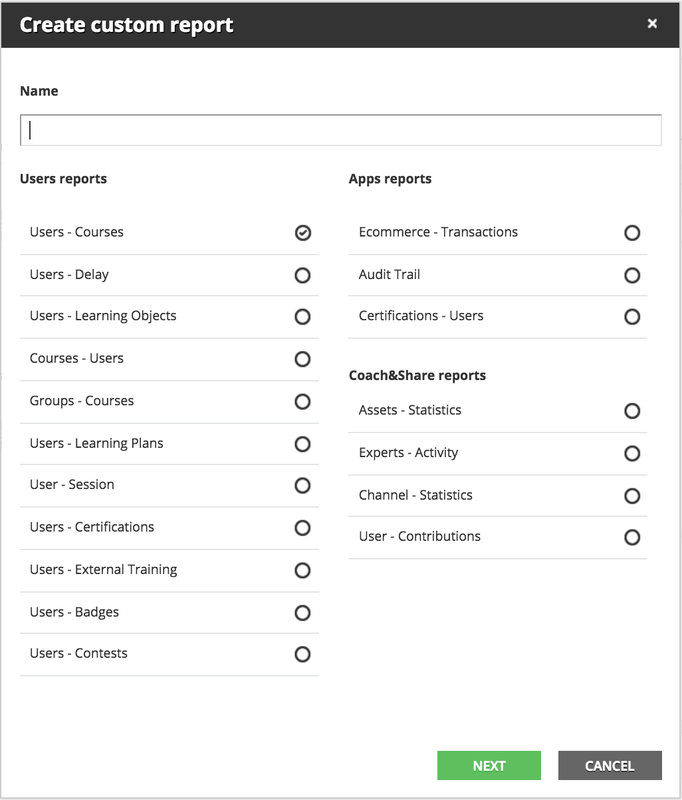 Runs a report with the progress details of each selected user for each course. You can also now retrieve information related to: Course Begin – End Date,Enrollment validity from – to, Final score. Users – Delay. By selecting this function, you will create a delay analysis. The delay report will display all of the users who have not completed the courses within the required deadline. You can set the deadline using the day of validity option in the Advanced Settings menu of a course. Users – Learning Objects. Selecting this function will help you relate the users to the learning objects. This report is useful for when you need to know the status of completion, or the scores for all content and/or material for each user. In case a course has already expired, that row of the report turns red. Courses – Users. By selecting this function, you will run a report with the progress details of each course selected for each user. Group – Courses. By selecting this function, you will run a report with the progress details of each group selected for each course. E-commerce – Transactions. Only available for the platform version 6.6.1 or higher. This report shows the list of the e-commerce transaction data. The report contains one transaction item per row, with the information in columns: transaction ID, username, first name, last name, email, user’s branch, course code, course name, item quantity (greater than 1 only for purchased seats), item amount (in USD) session name (only for ILT classroom courses), session start date (only for ILT classroom courses), session end date (only for ILT classroom courses). For those using Docebo 6.9 or higher, you can also ILT locations, coupon code, and coupon descriptions. Audit Trail. Only available for the platform version 6.6.2 or higher, Enterprise solution, and Audit trail App required. This is a very useful report tool that can keep track of the administrative actions performed on the system and all the important changes related to course completion, enrollment status changes, and others. Users – Learning Plan. Only available for the platform version 6.6.2 or higher, Learning plan App required. By selecting this function, you will run a report with the progress details of each selected user for each learning plan. Users – Sessions. Only available for the platform version 6.6.3 or higher. By selecting this function you will run un a custom report with the progress details of each selected user for every session. Certifications – Users or Users – Certifications. Only available for the platform version 6.8 or higher, Certification & Retraining App required. These reports collect information about the certifications achieved by the users, divided either by certifications (Certifications – Users report) or by users (Users – Certifications report). Users – External Training. Only available for the platform version 6.8 or higher, External activities App required. By selecting this function you will run a custom report with the list of all the users associated with an external activity. You can filter the information by status: all external activities, approved, or awaiting approval. Users – Badges. Only available for the platform version 6.8 or higher, Gamification App required. By selecting this function you can easily get information related to badges, and who achieved which ones. Users – Contests. Only available for the platform version 6.8 or higher, Gamification App required. By selecting this function you can easily get information related to contests, and who achieved which ones. Assets – Statistics. Only available for those using Docebo 6.9 or higher, Coach & Share Module required. By generating this report, you will see all of the statistics related to specific assets that have been shared either privately or publicly in Coach & Share channels. Experts – Activity. Only available for those using Docebo 6.9 or higher, Coach & Share Module required. By generating this report, you will see all of the activity performed by the selected Coach & Share exports. Channel – Statistics. Only available for those using Docebo 6.9 or higher, Coach & Share Module required. By generating this report, you will see all of the statistics related to a specific Coach & Share channel. User – Contributions. Only available for those using Docebo 6.9 or higher, Coach & Share Module required. By generating this report, you will see all of the all of the contributions that a user has given in Coach & Share. Once you’ve flagged which kind of report you want to generate, insert the Title of the report then select the Next button. Now, choose the users on which you would like to run the report by selecting them from the Users, Group or Organization Chart tabs. 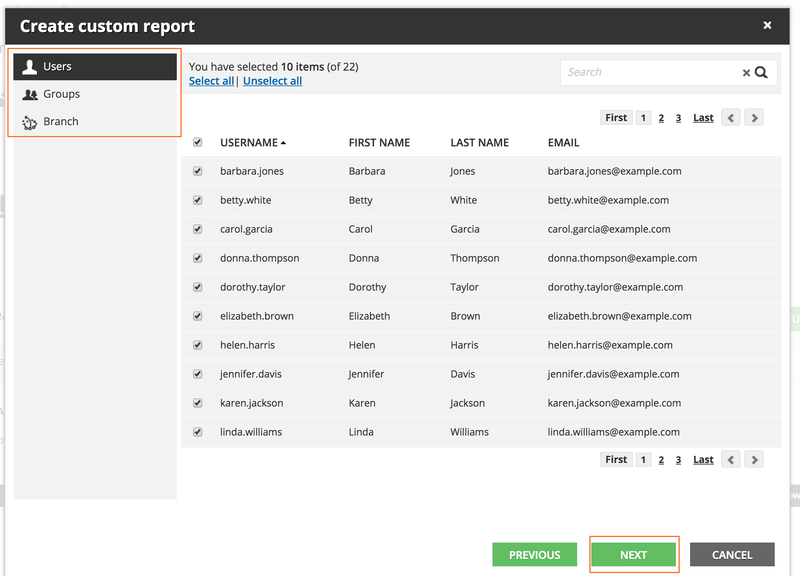 The system will keep multiple selections among tabs, so you can run a report for a combination of users, groups, or branches. Select Next to proceed. Now, select your courses for the report. You can choose specific courses or all of the courses in the platform. If you flag the option to select courses, you will need to then flag which courses you want from the list that will appear. 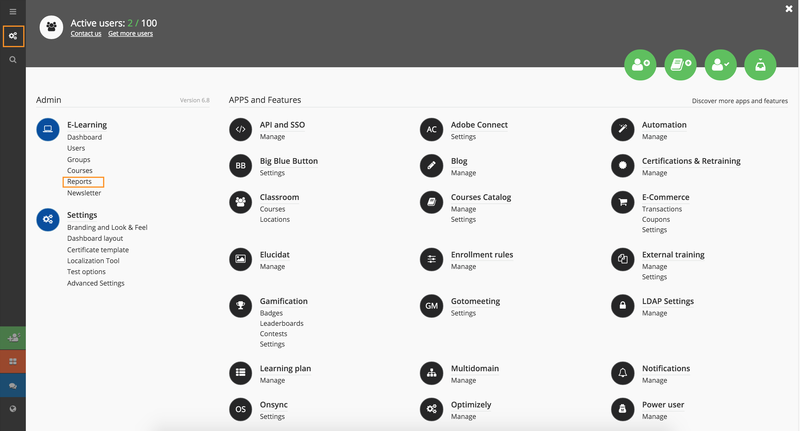 The course filter option displays all courses in the LMS. This means that you do not have to edit the report every time you create a new course inside the platform. Press Next to proceed. Now, the information you select on the next page is determined by which type of report you flagged to generate. This could be user additional fields, selections specific enrollment or creation dates, learning object types, etc. Once you’ve selected all of the information you would like to include in your report, you can schedule the sending of the report, save it, view it, or return to editing mode. Please note that if you created a report with course information, the value in the Course Name column of the report will transform into a hyperlink, which, when clicked, will take the Superadmin to the related course. You can export the report in .xls, .csv, and .html. By pressing the menu icon in the report’s row in the list of reports on the main reports management page, you can schedule, edit, or delete the report by pressing the corresponding items in the dropdown menu that will appear. If you want certain Power Users in your LMS to have the ability to view the report, you can press the item in the Filter column of the report’s row in order to edit the visibility. Public. Report will be visible to all Superadmins, owners, and Power Users. Private. Report will only be visible to the Superadmins and the report owner. Select Users. Report will be visible only to users of your choice. Once you’ve flagged your desired option and pressed Confirm, you will see the new privacy setting in the Filter column.